Mercedes-Benz S-Class Performance, Engine, Ride, Handling | What Car? The S-Class’s engine line-up starts with a 282bhp 2.9-litre straight-six diesel in the S350d. That’s enough to breeze it from 0-62mph in 6.0sec, and it feels every bit as quick in reality. The higher-powered S400d is better still, with an extra 53bhp giving it even more punch off the line. But, regardless of which you choose, it's how effortlessly the S-Class builds speed, rather than its outright pace, that is perhaps its greatest asset. The first of the petrols, in the S450, is a straight six again, but this time with a 3.0-litre capacity. It’s no ordinary petrol engine, though, but in fact a mild hybrid. It uses a 48-volt electrical system to supply an electric compressor – basically a turbocharger powered by an electric motor – and an electric motor attached to the back of the engine, giving it near-instant response along with better efficiency. And there’s a regular turbocharger, too, boosting mid-range power. All of this makes for swift progress from the moment you plant your foot down. There’s also an S500 that uses the same engine but with a bit more punch and no worsening of economy or emissions. For a full-blown plug-in hybrid, there's the S560e. This uses a 3.0-litre V6 petrol engine, rather than a straight six, along with a bigger electric motor and a 13.5kWh battery, meaning it can run on electric power alone for approximately 30 miles – ideal for short inner-city commutes. There’s enough electric power to gently accelerate up to motorway speeds and, with the two power units combined, there's strong and consistent acceleration. Fancy something quicker? If so, there’s also a choice of 604bhp from the twin-turbocharged V8 in the AMG S63 or a scarcely believable 621bhp in the AMG S65. Needless to say, both provide sports car levels of acceleration, all while cuddling you with heated and reclining leather seats. Whatever engine you choose, you will get a nine-speed automatic gearbox that responds well and changes gear smartly. Despite its standard adaptable air suspension, the S-Class’s ride quality isn’t quite perfect in every situation. Around town, you can feel the effect of larger imperfections reverberating through to the interior, although to a slightly lesser extent than you would in the 7 Series. But as the speed increases out on the open road, the ride morphs into feeling supremely supple and comfortable. The S-Class is easily a match for the very best in the segment in this regard, and considerably better controlled than the Range Rover, which tends to wallow in bends and bounce more perceptibly over dips and crests. This being an S-Class, though, things don’t stop there: depending on which model you choose, there are various options to improve things further still. Magic Body Control, for example, uses a stereo camera mounted in the windscreen to scan the road surface ahead and then pre-emptively adjust the suspension to deal with it. It’s astonishingly effective, to the extent that when travelling over a series of large speed bumps, you’ll barely register their presence. Then there’s the Curve feature. This leans the S-Class in to bends like a motorcycle. The result is less sideways g-forces trying to whip you out of your seat, ergo enhanced comfort. You don’t necessarily buy a car like the S-Class for its B-road agility, yet by this measure the big Mercedes doesn’t disgrace itself. It might not be quite as sharp as the 7 Series, but it offers good body control, especially when firmed up in the Sport mode. You do notice some body lean, though, and the limited bolstering of the seats means you find yourself sliding a little around tight corners. But the S-Class has better-weighted and more precise steering than the A8 or Range Rover, so despite its bulk, you can stroke it along with relative aplomb. Just remember that the added weight of the S560e’s batteries makes it feel a bit more cumbersome in the bends. It’s on the motorway that the S-Class really feels at home, though. Even at three-figure speeds on a derestricted German autobahn, it feels resolutely stable, so bumbling down the motorway at 70mph won’t challenge it in the slightest. Even the S350d diesel is smooth and quiet whether you're cruising or pressing on. 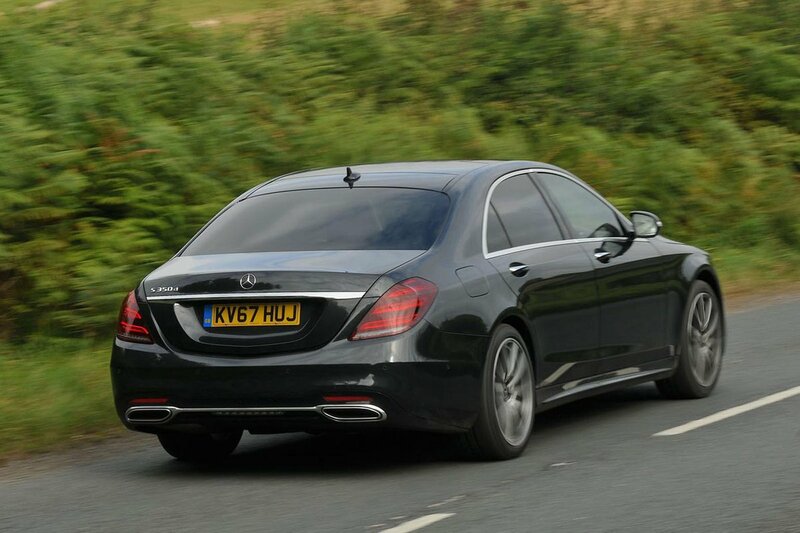 It's so good, in fact, that it almost matches the ultra-refined nature of the S500 petrol, which is high praise indeed. Neither betters the tranquillity of the hybrid S560e running on electric power alone, though, and when its petrol V6 engine does kick in, it's almost always seamless, with only the occasional nudge to suggest the two power sources merging. We just wish its V6 was as smooth as the straight-sixes found in the S450 and S500. Then there’s the sporty AMG S63. This has a muted V8 burble most of the time that turns into a full-on bark when you activate the sports exhaust and give it some beans. Switch the S63 to its sportier drive modes and the nine-speed automatic gearbox delivers quicker changes that result in a slight thud in the back. But fear not; if you keep it in the Comfort mode, it’ll shift just as seamlessly as the rest of the slick gearboxes in the S-Class line-up. The S-Class is as enjoyable to spend time in on a motorway cruise as any of its rivals; the world outside simply whizzes by, and the small but noticeable wind and road noise are forgiven due to the overwhelming cosetting feel of the car.